We’ve been hearing for quite some time now about the effectiveness of running Facebook ads on mobile devices or in the desktop News Feed. But the sidebar? “Completely worthless!” they shout. It’s conventional wisdom that it is. And maybe it’s true when applied to the general population. But sometimes you need to double check conventional wisdom to make sure it applies to you. That’s why I decided to take a closer look. And what I found is likely to surprise you. It’s always important to point this out from the start. We’re talking about the results for only one Page during a three month period. Sample size, industry, copy, landing pages, products and a whole lot more factor into these results. I eliminated any Promoted Post that was created for the purpose of engagement, but still managed to receive one of these actions. The four main countries I target in my ads are the United States, United Kingdom, Australia and Canada. As a result, cost per action will always be higher. I know. You can get ridiculously low Cost Per Like. But I’m focusing on quality over quantity here. As a result, costs are higher (but you’ll see results follow). Shortly, you are going to see why I believe I should be dedicating far more of my ad spend to the sidebar. If you aren’t using the new Facebook ad reports, you need to do it now. This is how I’m able to break down what my Cost Per Desired Action is by placement. No, I didn’t create a different ad for each placement. Facebook breaks all of this down for me, which is incredibly valuable. It now allows me to optimize and spend my money more efficiently based on the results. I took all of the ads run during the past 90 days and found the average CPM based on placement. Keep in mind that this is an average covering all targeting. So when I target Fans only, for example, these will be significantly higher. But I also target large pools of non-Fans to bring the average price down. You probably aren’t surprised that mobile CPM is the highest here, and it really isn’t close. I’ve actually seen sidebar CPM below $.05 in many cases. Let’s think about what this means. 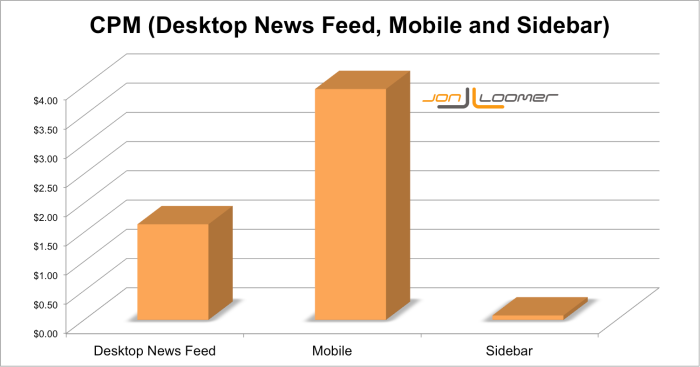 While Mobile or Desktop News Feed may (not confirmed yet) result in more desired actions per impression, the significantly higher CPM means that you are going to pay 20X or more for each impression. So in the end, the sidebar could be most efficient. And I have a feeling that’s what we’re going to see! 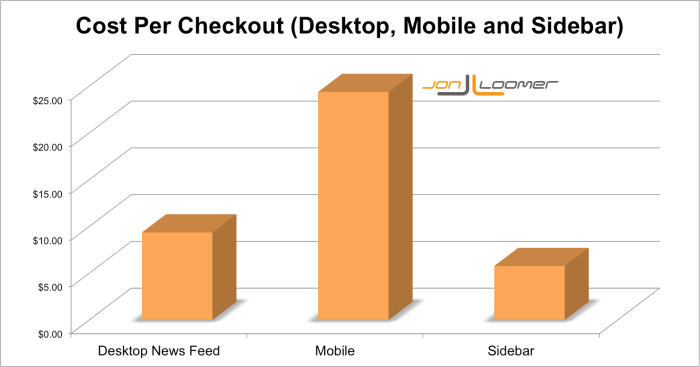 In order to analyze the results for checkouts and registrations, of course, I’ve been using Conversion Tracking. I hope you are, too! Following is a chart showing the Cost Per Conversion of my campaigns that were run for the sole purpose of selling during the past 90 days. I spent a total of $520.29 on these ads. You’ve probably heard my story about getting a 35X ROI during the first month of promotion of my Power Editor training course. 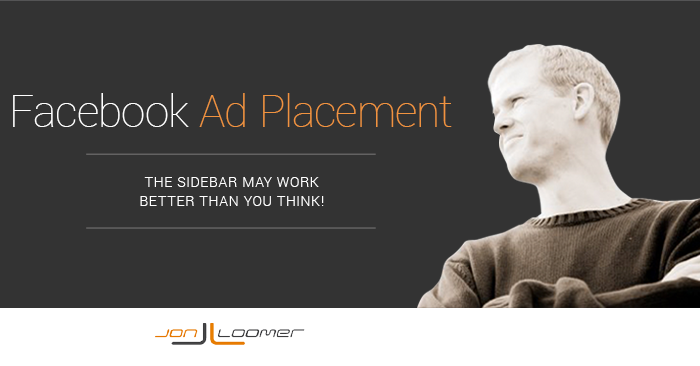 Facebook ads are pretty darn powerful! Of course, I haven’t been able to maintain that ROI. But keep in mind that the following CPA numbers are going to be for products that were sold at either $73.50 or $147. In most cases, I’ve stopped ads that go to mobile devices. While a CPA of $24.39 isn’t a negative ROI by any stretch of the imagination, it’s nowhere near as efficient as desktop. But sidebar is most efficient? I did not see this coming! I’ve also been running ads with the goal of driving registrations to my weekly webinar. I have spent $576.69 on these ads. Once again, mobile is far more expensive than the other two placements, and the sidebar ends up being most efficient. Unfortunately, I was only putting $25.83 of my budget towards the sidebar (that will change!). I am constantly running campaigns to increase Page Likes. I have spent $1,788.33 on such ads. Mobile isn’t a complete waste this time, but these ads were still most expensive. 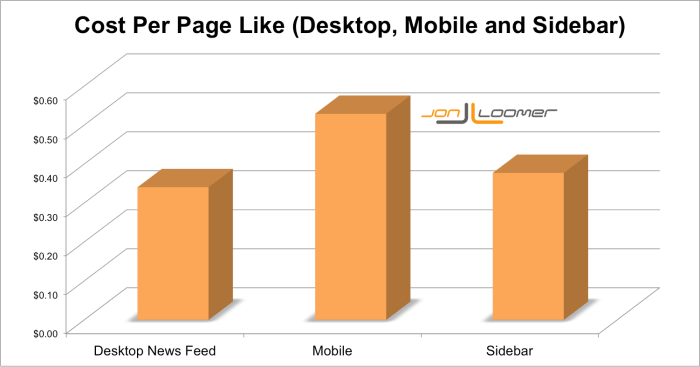 The desktop News Feed ends up being the slight winner when it comes to generating Page Likes. Once again, we’ve been led to believe that running Page Like ads on mobile devices is extremely effective. It’s not as effective as desktop for me. The bulk of my spend here has been going towards Desktop News Feed. I may cut off mobile entirely going forward. 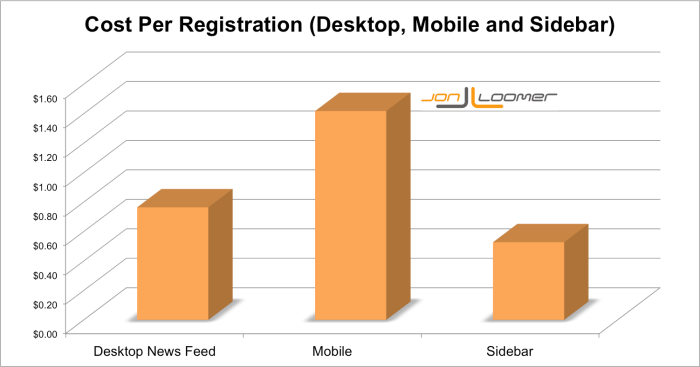 Clearly, I’m seeing results (sales, registrations and Page Likes) from the sidebar, and at a greater rate overall than I am on either the desktop or mobile News Feeds. But this does not apply universally, and you should check your own stats. Are you seeing similar results? Let me know in the comments below!